Minneapolis, MN – ABDO (abdopublishing.com), a leading educational publisher, introduces Abdo Zoom Biographies, the newest online database for PreK-2 learners. The second of several Abdo Zoom databases to be released allows young researchers to delve into the lives of athletes, world leaders, and more. “This database is one of the significant components of the bigger Abdo Zoom program launch,” said Paul Abdo, Editor-in-Chief. Much like the initial database — Abdo Zoom Animals — Abdo Zoom Biographies offers articles with modern appeal, interactive elements, and streamlined site architecture. The new database provides key information about 160 influential people, zooming in on cool facts, quick stats, and key dates associated with each. Students can learn about the early lives and legacies of these history makers as well as what made them memorable. 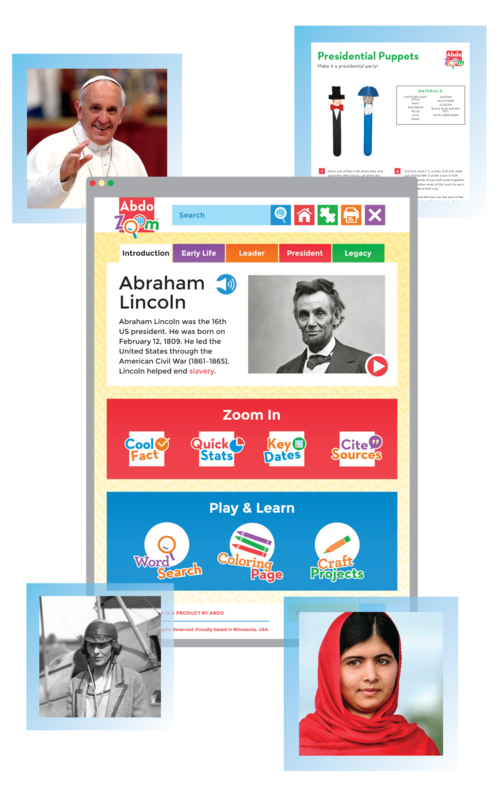 Abdo Zoom Biographies functions as an online encyclopedia for early readers, allowing them to explore biographical information in a safe, reliable format. The highly engaging content features read-along audio, paramount primary-level content, Instant Access, and more. The puzzles, crafts, games, and coloring activities reinforce new glossary terms and concepts. With this second installation to the Abdo Zoom library, the company continues its mission to revolutionize digital access for libraries. ABDO, a family-owned company, has been publishing educational materials for more than 30 years, including library-bound hardcover editions and a variety of digital products. The company is comprised of five divisions: Abdo Publishing, Magic Wagon, Spotlight, Abdo Kids, and Abdo Digital. For more information, visit ABDO online at abdopublishing.com. We stand behind everything we sell, and guarantee customer satisfaction in both our products and our service. For over 30 years, ABDO has been publishing exceptional children’s PreK–12 educational titles for libraries and schools. Read about our humble beginnings and how we've grown to become a leader in the industry. Get free digital titles and start your free Abdo Digital Bookshelf today! Learn more about free Abdo Digital Bookshelves.